We are not birders. While we love them, and host lots of them here on the farm, we cannot identify most. I can name most breeds of chickens, but that is because I see them live and labeled at the farm show. The birds that live at the farm year round? I'm astonished every spring when the gold finch appears, and then a naturalist tells me they are here year round. They just are not gold year round. And that is my problem: I don't know the ages, the stages, the songs. I downloaded an app and listen and look at the pictures but I really still only know the same handful of birds: the eagle, robin, blue jay, cardinal, hummingbird, Canadian goose, red tailed hawk. And then there is the blue bird. I stayed at a friends house and walked her yard with her, where she was feeding blue birds mealy worms. The birds had nested near the feeder. It was in the country, her house had acres as did her neighbors, with trees near by. Her husband is legally blind, and they worked to attract blue birds because the song is so rich and the color so bright he can feel them. As a resident of much denser populated areas it had never occurred to me that blue birds could be right outside your home. While easily identifiable, it always seemed like they were all kinds of elusive! We moved here and did not see blue birds the first year. We set about doing what we do, including making tons of compost. And our compost produces millions of mealy worms...not something we planned on, but there they are, for months out of the year. The same months the blue birds are scouting, looking for homes, making babies, fledging them out. We have seen many blue birds here over the years. We have a small tree line (maybe 50 feet deep and almost the width of the property) and a steady supply of mealy worms along with wide open fields, no chemicals and a neighbor who mows walkways a few times through the year. Mostly pretty quiet and undisturbed. While collecting the mail the other day, Homer saw the first blue bird of the year. He heard it too. Now we are hearing birds singing, at dawn and dusk and all during the day too. We keep planting native trees, shrubs, grasses and flowers. The 30 foot buffer we left between our property line and our fence has non-natives growing in it, but we keep adding natives too. We know they host the right insects at all stages for the song birds at all stages and we want that! We will also continue to make compost. That produces what keeps blue birds happy. Jerry was here yesterday. 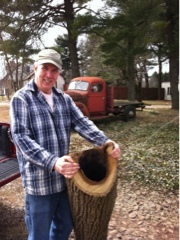 He helped locate a hollow log to bring back to the farm. And to get the footings in place for the grain bin. 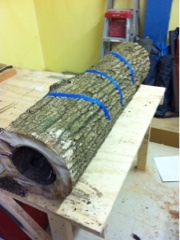 The log will get cut cross wise. A few other modification will get just the right size home for blue birds. A roof and a metal pole (prevents predators from getting to them) and 4 bird homes will be ready! Today is pea planting. Every last pea seed must go in before bed time tonight. More potatoes should go in too. Tomorrow will be for the birds, getting homes ready for one of the handful of birds we can identify. And one of the best singers, and most beautiful. Because we live in the country and we can.